In this in between time, the liminal space between Jesus’ death and the women finding the empty tomb, the desolation and loss we might feel is countered by the work of Joseph of Arimethea and the women who in their own human way express love for Jesus. The scriptures tell us that we love because God first loved us and in their lives Joseph and the women and encountered and seen something of God’s love in this man. They may not have fully understood Jesus’ identity or his love for them, nor loved Jesus’ perfectly, but they responded as friends and family to what occurred with their human love. At the overarching level we might reflect on the idea that Good Friday is the expression of the depth of God’s love for us. In Jesus, God demonstrates that there is nothing God will not do to help us understand that we are loved. There is nothing God will not do to draw us deeper into the relationship of love with God, with one another and with all that God has made. There is nowhere that God will not go to find us, even death. Yet, for Joseph and the women the reality was a more personal and earthy experience. Their response was probably more along the lines of what we experience when we watch someone we love die. The body before us is present but the person we knew is absent. The best anyone can do is to treat the body of the person we have loved with dignity, to treat the body of the one we have loved in life with love now. The body of Jesus was gently taken down from the cross by a follower. Jesus’ body was wrapped in cloth and laid in a tomb. The women prepared the spices and ointments as an expression of their love. The simple acts of people who wanted to show respect and dignity to their friend in death. The bigger story goes on in the background without their comprehension. Jesus’ final words in Luke’s gospel are ones of hope, wherever he is going in death God will be there. 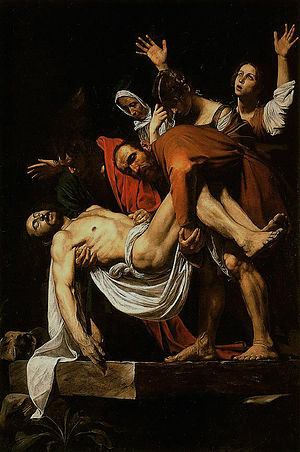 “Into your hands I commend my Spirit.” The mystery of God’s love in death, to be affirmed on the day of resurrection, may still allude Joseph and the women and, even us, on Holy Saturday. This is an experience that we can often find ourselves in our journey of faith. We do not quite know, comprehend or understanding what is occurring in our lives or in the world but we simple try to hold on to the idea that we are loved and that we called to love. We know that even in this time of confusion, as God’s love lies with Jesus in the tomb, we can respond. We can act. We can express in a small way our love, we can go on in hope. Hope that even in death God has not deserted Jesus and nor will God desert us. Maybe, when we treat the bodies of those we love with such dignity in death, we are still expressing that hidden Easter hope that God’s love defeats death and though absent from us in death God is present with them. We love because God first loved us. On this day, this Holy Saturday, we seek to love even as we have been loved. This entry was posted in Uncategorized on 26/03/2016 by stlucia.master.